Use the drop down next to the user name to change the product mode: Mode options are designer, Runtime or bypassed. Designer mode: The user has full access to change any setting or options. If the user is manager or above then the can also alter or change the custom tables fields and layouts. Run time Mode: the user has limited access to only the modules specified in the Active column. 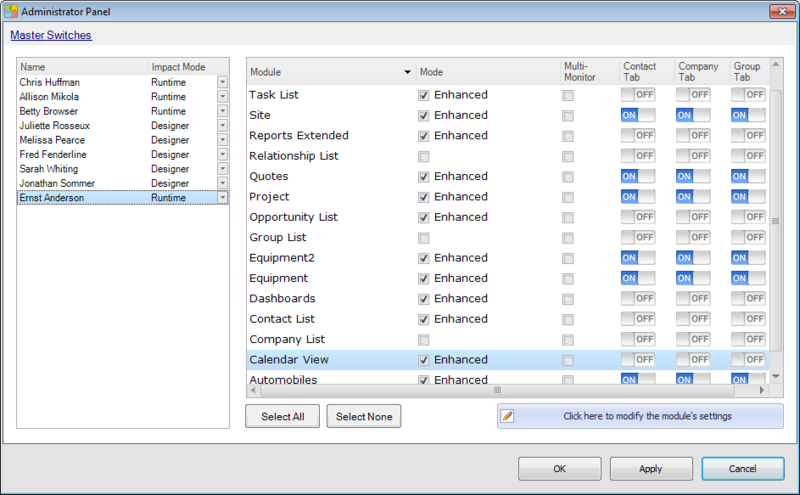 Checking the mode column will allow the user to enhance the list view, checking the multi-monitor column will allow the user to move the list view to a separate monitor, swtiching the tab columns to on will allow the use to have the enhanced view on the tab. Bypassed Mode: Impact has no effect inside the ACT interface. This option is used when only a limited number of users need access to modules while others need no Impact modules installed. Bypassed mode is also useful when installing Impact on a terminal server and only the sales department need access. All other users on the server can be set to the bypassed mode.